Rev Adam Tretheway and Rev Christa Megaw (International Mission Officers, SA Synod) are currently on a goodwill trip to visit partner churches in Korea. Here's a photo of them near the border with North Korea. 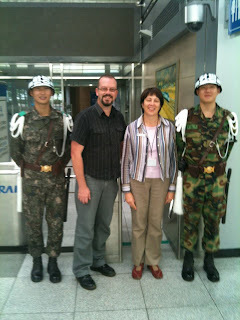 The UCA supports projects in North and South Korea.